The reason is there are position sensors in the left and right elevators. These Elevator sensors are dual channel with one channel reporting to the Flight Data recorder. The Investigators will have seen a split if a breakout occurred and it should have been on the chart and reported. Considering that the Leeham author didn't mention the elevator position sensors I would side with the Investigators. Of course, the investigators and also Boeing have more information. They have 69 hours with 1790 parameters from the aircraft. We have access to 40 of those for the last hours. We lack things like pitch and roll angles among a lot of other information. My reaction is at the same time as the counter trimming changes to short blips the pitch forces separate for the two channels for the first time during these two flights. I have since got a better schema on the pitch channel breakout mechanism, it's not a clutch, nor a no breakout or breakout mechanism. It's here described as a progressive cam and spring-loaded roller unit which allows progressive movements between the yokes and therefore a difference in the force the force transducers register at high differences in Yoke force in the two channels. The separation can mean the two pilots both pull on the Yokes and in different directions. What's disturbing is one stays put (red = Captain i interpret it as) while the other goes significantly higher from being the follower. Then the green stays at the put level while the red goes high. When one Yoke has moved before, the other has followed in force, not now. We can explain most other traces but not this part. Strange. At the same time the crew only counter trims for short blips, leading to full MCAS nose down trim and then they plunge. They could be in a turn and one doesn't normally trim in a turn but the separation of the traces are no explained by a turn unless the two pilots are in un-sync on the Yokes. The increased dynamic pressure to the Elevator Feel Shift Module which decides the hydraulic pressure to the Elevator Feel and Centering Unit at the elevator should be the same to both sides. It shouldn't cause the differences in forces we see IMO. 1) The Chart has Pitch force labeled as CCFORCE_PITCHCWSLOCAL_FDR and CCFORCE_PITCHCWSFOREIGN_FDR. We can not tell which CWS pitch sensor is being displayed. The captains or f/o's sensor will display as local or foreign. I have tested it and each sensor feeds the local and foreign data display. 2) You can't equate force with elevator position. You can pull the column full aft and have a 50lb split between the f/o and captain. This can happen when one pilot felt the aircraft wasn't responding to nose up command of the other pilot and pulled harder. The column won't move anymore but force on it will be greater. You also push and pull in opposite directions and one sensor will read negative pounds. I registered a 70lb split (-30/+40) when I pushed /pulled the columns with one hand on each. The Graph doesn't show one line in positive and one line in negative, so the authors suggestion that the pilots worked against each other is wrong. And, if breakout had occurred, surely a position trace would have been included in the initial preliminary report. A clear signal from the largest 737 MAX operator / customer. Can be just a knee jerk reaction. Is that actually meaningful information, or pilots are now tasked with supervising automation which already supervises them? For just a few seconds until it kicks in again (assuming conditions that caused it to activate are still present), no? No, the authority is always there. Yes, MCAS will attempt to trim nose down 5 seconds after pilot trim input (assuming conditions requiring its use exist), but the authority for pilots to override it is always available. so you have to kick it in the shins every 5..10 seconds. That is kind of a Tamagotchi design ( feed me, go potty, warm my belly, comb my hair, feed me, ..). Or you could just turn off the electric trim using the cutout switches and not have to worry about it. Or you just turn it off when it's not working properly. The last pilots did that Step 1 but these guys went your Tamagotchi route instead. Isn't this what 99% of modern "piloting" is all about, making sure the plane is doing what it's supposed to by constantly monitoring all those large, shiny displays? The 737 system needs to be fixed and it will be, probably something as easy as what SW is doing. And Boeing is going to be on the hook, rightly so, for missing a crucial piece of operation that led to this accident. But there's plenty of other stuff to focus on here too. Not sure I understand your comment. The prior pilots turned it off and hand flew the plane to safety, these guys didn't know how to do that (Boeing's potentially massive liability), or just didn't connect the dots so apparently obvious to the prior crew. Bad sensors or syestems, correct responses, basic flying skills..lots of accidents have happened in this general category that should not have. Outside of actual piloting for 10-25 minutes on a 1 hour or 19 hour flight, the main job is to supervise the systems and understand when they depart from "helpful" to "lethal". I’m not sure it’s all that simple (so to speak). I’m at a loss as to how this got through the certification process let alone Boeing’s own in-house analysis? They designed a system poorly then didn’t provide clear communication on what it is, how it works, and what to do when it inevitably is fed erroneous data. Instead they designed a system that fights the pilots who are now trying to troubleshoot with one hand tied behind their back - and with nearly 200 lives in their hands. That’s not just libelous, it’s borderline criminal, particularly if an investigation brings out emails and memos showing what they knew and when they knew it. I’m not doubting a fix can be made or that Boeing will “pay the price”, but whatever price they pay will be cold comfort to the families of those who died on this plane. I’m not accusing or absolving any other party. I have no idea what ultimately will be found in this investigation. I do know, though, that these pilots were setup to fail, and no amount of “That’s their job - to figure these things out” will change that for me. I dare anyone to willingly be put in their shoes and potentially face their maker to prove that point. I agree with what you're saying but would honestly be shocked and very upset of Boeing is discovered to have designed a poor system knowingly and then worked to cover that up to their customers. If they did do so then billions will get paid and execs may go to prison (again, rightly so). While it's no consolidation to the victims and their families I sincerely hope that Boeing thought the emergency response (hit switch and hand fly to nearest airport) was well known/intuitive. The prior crew knowing it would be testament to that. Passing the incident details to the next crew would've saved 189 lives, and somewhere along the way both incidents should have led to a global directive and proper fix without the lives lost. The root cause of the problem appears to be inaccurate AOA readings being fed to the MCAS computer. Here is a relatively simple fix that should prevent that. Part of the problem is that the AOA sensors, by design, do not give meaningful readings while the plane is stationary. That is easy to fix. Put a light spring or counterbalance load on the control vanes so that when the plane is stationary the AOA indicator reads 0. Measure the input at the MCAS for the AOA and if it is not zero, you know before takeoff. And if it radically departs from zero during the takeoff run you know you have a problem and what to do about it. Seem to be lots of duhh simple solutions around that are patently wrong. If it stays zero the pilot will also know it is wrong. As soon as the plane reaches significant speed it should change; AOA is almost never zero in flight, and it isn’t on the takeoff run even before rotation. If you are so confident that MCAS can be "just turn off" and "not have to worry about it", why the FAA required his addition in the first place ? Safety is not just a game where you can simply replace a bad designed protection by an reduced envelope ! While this is way of course now, I think the roadblock people are running into is the same one auto designers face: if the automobile were a new invention today using available technology today, the controls may look nothing like what they do now. Other than driverless vehicles, cars have steering wheels and foot pedals because long ago it made the most sense to manually operate the systems. (Early autos had tillers and hand brakes and throttle levers). Aircraft designs apply modern technology to ancient paradigms and the results aren’t always what we expect. And certainly if we were to start from scratch, controls would be very different, even more so than a side stick. Even the aircraft itself might look very different. But it can’t be done because of pushback by pilots, airlines, regulators, passengers, airports etc. And so we end up with the problem of an aircraft that would be too expensive to replace with a clean sheet but needs voodoo to keep it stable. I am hoping the CVR is found so that we can understand why when they identified that flying with flaps down minimized the trim issues, they continued to raise them. The FDR unfortunately, does not tell the full story. And do we end up with the problem of an aircraft that would be too expensive to replace with a clean sheet but needs voodoo to keep it stable. I don't really think there are any fundamentally new paradigms available. If they were there, we would see those in military pretty quick. But I can think only about HUD as a new element - and it is making the way into civilian products. The prior pilots turned it off and hand flew the plane to safety, these guys didn't know how to do that (Boeing's potentially massive liability), or just didn't connect the dots so apparently obvious to the prior crew. The prior crew were no aeronautical geniuses themselves as they continued flight to destination in a non-airworthy airplane. The problem is that the MCAS is not a optional automatic system. The MCAS is actually a required protection system with authority over the pilot due to the greater instability of the 373MAX compared to the previous 737 families. Pilot always has authority over MCAS, as has been discussed here several times, pilot trimming using the yoke trim switches stops MCAS trim inputs. It that case the MCAS is not longer a protection system. Always the same conflict: is MCAS is not a required protection authority, then the 737MAX is less safe than it predecessors as it have a reduced flight envelop that require extra training to flight without or against MCAS. Enough dead already. Was it ever a 'protection system? Surely it's primary purpose is to replicate, within boundaries, the flying characteristics of earlier 737's to protect 'grandfathering'. If it was a protection system, there would have been more emphasis on training, documentation, data sources, fail-safe, and multiple visual and audible warnings a pilot had turned it off, if in fact they could. What data did Boeing have following each of the last four flights? What errors were they seeing? Did they provide any solicited or unsolicited advice to the airline? Owners (including leasors) are under the impression the MAX is similar to the A320 family, and even 787, when it comes to monitoring condition and / or how it's being flown. WHY would an airplane with such sensor discrepancies be allowed to (be able to) take off? I will repeat what I posted weeks ago: This airplane was in NO WAY airworthy and the fact that it was cleared for service on the incident date (or previous two flights) is just astounding. Being a former gate agent myself,I agree with you.We both see the human point of view. But the experts here say that the plane was fit to fly.However,it is one thing to say that the pilot,having accepted to fly the plane,has full responsibility -which speaks volumes and I won't elaborate- and another thing to have to face the anguish, complaints and what else from the relatives needlessly.There is obviously a lot to learn from this accident. For an aircraft designed and first delivered in the 21st century, the airline should have comprehensive status reporting on the aircraft even before it lands, including deviations from profiles for the route being flown. The flight crew contribution should be to elaborate on symptoms and in-flight workarounds in response to questions from the techs. Who said the FAA required it? I have a hunch it might be both. Last edited by LDRA on Fri Nov 30, 2018 6:12 pm, edited 3 times in total. The failure mode of the JT610 left AoA sensor is still unknown (to the public at least). AoA reading while the plane is stationary (or taxiing) is really not a problem at all. Sensors have to be validated, by voting between multiple of then, or by predictive filters, because any sensor can fail in any evil way, no matter what. Single sensor input algorithm that actuate a critical control surface must be prohibited on commercial aircraft as soon as possible. More I think about this, more I am shocked about how this design could still be certified to fly today. Take some time reading documentation about the lasts AFDX avionic designs and you will certainly get a feeling about the gigantic gaps between the B737MAX design and the A380, B787, or A350 designs. I mean, almost no peoples (outside aircraft industry) realize how dramatically different those designs are. FAA requires an airframe stable in pitch up. i.e. taking the nose down must be possible in all flight regimes. The higher placed and larger drag source that represents the engine(cowlings) will at some point create/amplify pitch up moment. that must limit pitch up at all times to a value smaller than where the positive feedback into pitch(up) sets in. It does not fix the basic issue the new aerodynamics create instead it tries to limit attitude to save values. Afaics the MCAS is stuckoed on as a quick and dirty job. Not telling then is either due time constraints or the underlying mechanics do not lend themselves to being made public. This is exactly what all operators and pilots are now asking for ! Owners (including leasors) are under the impression the MAX is similar to the A320 family, and even 787, when it comes to monitoring condition and / or how it's being flown. There impression are totally false: the obsolete avionic of a B737MAX is nothing like the AFDX avionic of a B787, really not. 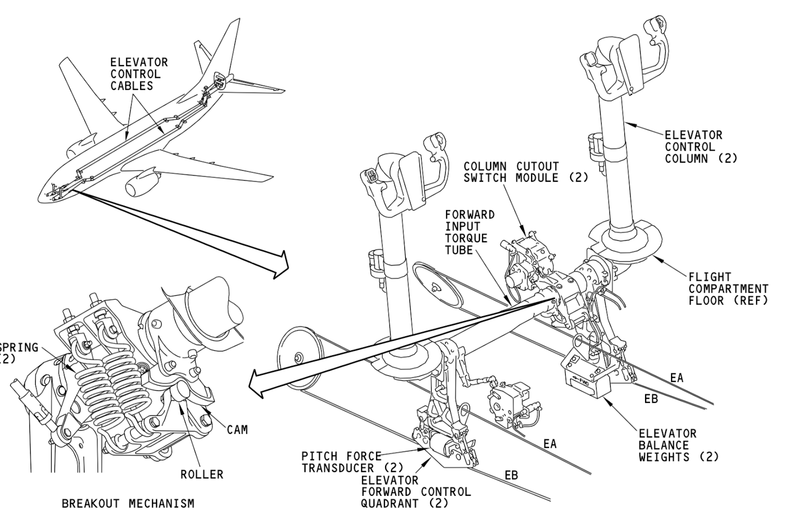 Even a A320 avionic is still far advanced compared to a B737, with for example triple sensors redundancy and well defined protection laws. "Boeing quietly" are Mr. Ostrower's words, just to be clear. Not only Mr. Ostrower's words, as many operators and pilots have publicly said that there did not know about the MCAS before the EAD. (Apologies, Wikipedia): On 5 November 2014, Lufthansa Flight 1829, an Airbus A321 was flying from Bilbao to Munich when the aircraft, while on autopilot, lowered the nose into a descent reaching 4000 fpm. The uncommanded pitch-down was caused by two angle of attack sensors that were jammed in their positions, causing the fly by wire protection to believe the aircraft entered a stall while it climbed through FL310. The Alpha Protection activated, forcing the aircraft to pitch down, which could not be corrected even by full stick input. The crew disconnected the related Air Data Units and were able to recover the aircraft." Not an A vs B, point is simply "the best laid plans of mice and men oft go awry" even with redundancy. A320: two AoA failures can generate a uncommanded pitch-down. A predictive filter would have rejected 1, 2 or even 3 failed sensors. The output probability would be degraded, but not up the point to lost the control. 1) comparing AOA indicators during takeoff roll (after sufficient speed has been gained for the sensors to start reporting), as well as a DISAGREE warning, would have prevented this accident, as the crew would have RTO'd. 2) Lion Air's specific model has neither flight display AOA indicators or a DISAGREE warning. So 1) wouldn't have applied on their flight anyways. Should those pilots not be suspended etc for not turning back during that flight. Had they turned back would we be even in a thread about a disaster now? Them turning back would have shown the plane not airworthy and maybe got a better maintenance job done etc? Without a doubt. I'm sure that if their bodies are ever found they will be sitting in front of HR with their union rep. I think he’s talking about the pilots from the prior flight who flew the entire trip with stick shaker activated and manually trimming. Congratulation to Southwest for there excellent reaction and communication to improve safety, even if there unfortunately can't magically change the old 737 design. Frankly, that kind of improvement should have been pushed directly by Boeing to all operators. We have more information about Boeing possible plans from journalists than from the company itself. Depressive. "An American Airlines spokesman said AOA indicators on the primary flight displays have been a feature on it's Next Generation aircraft since the late 1990's and are featured on it's 737MAX aircraft as well." It sounds like Southwest was too cheap to install the feature until now. The Bournemouth incident was a 733, so even the 737 Classics can pitch up dangerously if you apply thrust in the right conditions. It's knowable with predictor algorithms based on flight dynamic model feed by all information available on the aircraft. Each inputs values modify the probability output of the predictor with it own probability to fit the result. If all information but a single sensor agree on a probability, the one that disagree will be almost rejected. Sadly this kind of algorithm is still not used for aircraft air data sensors. Advanced systems beyond steam gauges on the 737 have been layered on over time. And each layer and techno splotch probably is more or less standalone, has limited inputs, a "NEW" function output. There is no holistic access to system input to do what you propose. It a desired function. I even hope it will be a required function in the near future. The complexity of a flight dynamic predictor is not that great, every single aircraft simulator, from engineering design to pilot training, have this algorithms since decades. It's really the opposite compared to adding a quickly ill designed hidden lethal MCAS. Another reason why we need a clean-sheet NB design from both manufacturers. System design is still stuck in the 1988 mindset thanks to the A320-200. This is true. For better or worse, the aircraft can only act on information fed to it by sensors, and if the sensors are wrong, problems happen... Rather unfortunate when you get the same failure on two independent sensors, and also rather unlikely. That being said, there are procedures for such events. Not really. An A350 is way more advanced than an A330 or A320 when it comes to systems, and that includes air data redundancy and switching. They opted for perhaps the most important piece which is the AoA disagree alert. I was responding to the comment stating "System design is still stuck in the 1988 mindset thanks to the A320-200". It isn't, and not even on the A320 irself, which has several new design features introduced mid-life. I'd argue that the A320 is still a "modern" aircraft control systems wise. The basic flight control logic is the same as on the A350, a clean sheet design, showing that the fundamentals were sound. Thanks fadecfault. For you to actually go in the aircraft and check it out is brilliant and really helpful! The split in the trace then means, for instance, the F/O started pulling as he was asked to help the captain or thought he wasn't keeping the nose up and dug in. The strange thing is still that his trace, the green, goes down when the red goes up when the dive starts. We need more sensor traces to understand this. Is the Stall ID information in the SYMD and FCC different? As is now clear from the traces we are not facing an MCAS range AoA situation for JT610 (or previous flight), the SYMD must have full Stall ID to start the stick shaker. It means the aircraft is flying in the stall AoA range the whole previous flight and for all the fatal flight except a short moment. With this AoA, does the FCC have Stall ID? A) If not the Stall trim loop in the FCC has other trigger criteria than the pre-Stall MCAS loop. Why in such a case is MCAS allowed to have laxer rules than Stall? The trim authority seems to be the same, other than it's not clear if the Stall trim is stopped after 10s, waits and then continues. It might continue until the AoA goes below stall value. B) If the Stall criteria in the FCC is the same for MCAS and Stall trim the Lion Air scenario is not a concern for the 737 MAX but for both 737 NG and MAX. The absence of FAA being active on the NG points to A. But is this the case really? Or is there something wrong in my logic? Last edited by ferpe on Sat Dec 01, 2018 11:24 am, edited 2 times in total. For better or worse, the aircraft can only act on information fed to it by sensors, and if the sensors are wrong, problems happen... Rather unfortunate when you get the same failure on two independent sensors, and also rather unlikely. Correct, but why only take in account 2 or maybe 3 redundant sensors ? Flight dynamic predictors filters can take in account a lot more sensors to produce a probability histogram of the output variables. Failed sensors will only degrade the probability, reducing the safety domain, but still allow to flight. You can view this as a smooth transition from the actual automation down to an automated "pitch and power" control that at least allow to save the aircraft. Sensors are not the only source of information, flight dynamic model can provides a lot of information too, especially in situations with a reduced set of sensors. Last edited by PixelFlight on Sat Dec 01, 2018 11:32 am, edited 1 time in total. Correct, but why only take in account 2 or maybe 3 redundant sensors ? Flight dynamic predictors filters can take in account a lot more sensors to produce a probability histogram of the output variables. Failed sensors will only degrade the probability, reducing the safety domain, but still allow to flight. You can view this as a smooth transition from the actual automation down to an automated "pitch and power" control that at least allow to save that at aircraft. Certainly. The issue of undetected failures still remains, however. Sensors sometimes give an inaccurate output that still seems correct. We are talking about the ancient core of the 737 and you bring up the A320 setup ( which saw continuous refinement but not paradigm changing step changes in the A330/A340, A380 and A350XWB. A new airbus NB craft will with high probability show further refinements. The bigger question is if Boeing will ever disassociate itself from the layer cake approach of "history embalming" paradigms. There is always such an issue, including inaccurate human eyes - aka pilot disorientation in this context. This is more about maximizing error detection and ensuring flight safety than anything else. Sensor network doesn't have to be perfect, it has to be good enough for pax and crew to walk away from landing site with as few exceptions as possible. I'm talking about the earlier flight ?? I wonder their thoughts when they heard the news of the crash on the next flight? Could they have done more to prevent this? What would you expect from pilots leaving a plane having experienced the above scenario? Last edited by Interested on Sat Dec 01, 2018 11:59 am, edited 1 time in total. This is not an issue: the predictor filters was precisely designed to work with inaccurate sensors. The Kalman filter is the simplest of them and was designed for the Apollo missions. Since that time, the predictive filters family have grow and includes today some some very advanced concepts like the particle filter. There are studies about aircraft sensors redundancy using predictor filter and there show that a flight dynamic model is required into the predictor. And the flight dynamic model algorithm already exists in all simulators. All the technologies to make the next generation of "sensors + predictors" redundancy already exists. I have heard rumor [unconfirmed...] that the head MX who jotted down his signature and gave the clean bill of health for the plane for that fateful flight was under watchful eyes of psychologist(s). I'm sure he's in a tremendous state of shock. I would imagine the two pilots from the previous flight were probably in similar state of shock- notwithstanding the omission of the stick-shaker during the flight in their log/report. We need the CVR. The traces are completely consistent with the captain giving control to the FO and then taking it back. (Suggest reading the Boeing paper on how the traces are interpreted in the link I posted back on page 36 or so.) He apparently didn’t ask the FO to help pull, or the FO’s harness wasn’t tight and he slid forward, or he was terrified, or who knows what. Conversely, it's Boeing that will be blamed for not making this a standard feature. I guarantee it will be now but sadly too late for the crash victims.